For other uses, see Serres (disambiguation). 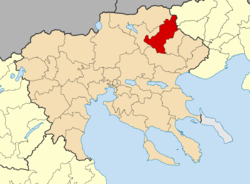 Sérres (Greek: Σέρρες [ˈseɾes]) is a city in Macedonia, Greece, capital of the Serres regional unit and second largest city in the region of Central Macedonia, after Thessaloniki. Serres is one of the administrative and economic centers of Northern Greece. The city is situated in a fertile plain at an elevation of about 70 metres (230 feet), some 24 kilometres (15 miles) northeast of the Strymon river and 69 km (43 mi) north-east of Thessaloniki, respectively. Serres' official municipal population was 76,817 in 2011 with the total number of people living in the city and its immediate surroundings estimated at around 100,000. The city is home to the Department of Physical Education and Sport Science of the Aristotle University of Thessaloniki (Greek: Τ.Ε.Φ.Α.Α. Σερρών) and the Technological Educational Institute of Central Macedonia (Greek: ΤΕΙ Κεντρικής Μακεδονίας), composed of the School of Technological Applications, the School of Management and Finance and the School of Graphic Arts and Design, with at least 10,000 Greek and international students. The Ancient Greek historian Herodotus mentions the city as Siris (Σίρις) in the 5th century BC. Theopompus refers to the city as Sirra (Σίρρα). Later, it is mentioned as Sirae, in the plural, by the Roman historian Livy. Since then the name of the city has remained plural and by the 5th century AD it was already in the contemporary form as Serrae or Sérrai (Σέρραι), which remained the Katharevousa form for the name till modern times. In the local Greek dialect, the city is known as "ta Serras" (τα Σέρρας), which is actually a corruption of the plural Accusative "tas Serras" (τάς Σέρρας) of the archaic form "ai Serrai" (αι Σέρραι). Τhe oldest mention of this form is attested in a document of the Docheiariou Monastery in Mount Athos from 1383, while there are many other such references in documents from the 16th, 17th, 18th and 19th centuries. It was known as Serez or Siroz in Turkish. In the Slavic languages, the city is known as Ser in Serbian, while in Bulgarian it is known as Syar (Сяр) or Ser. Although the earliest mention of Serres (as Siris) is dating in the 5th century BC (Herodotus), the city was founded long before the Trojan War, probably at the beginning of the 2nd millennium BC. The ancient city was built on a high and steep hill (known as "Koulas") just north of Serres. It held a very strategic position, since it controlled a land road, which following the valley of the river Strymon led from the shores of Strymonian Gulf to the Danubian countries. The most ancient known inhabitants of the area were the Bryges (Phrygians) and Strymonians. Afterwards were the Paeonian tribes of the Siropaiones  (since 1100 BC) and Odomantes (from the early 5th century BC until the end of antiquity). These populations mainly engaged in agriculture and cattle-raising especially worshiped the Sun, the deified river Strymon and later the "Thracian horseman". The ancient city of Serraepolis was founded in Cilicia by Siropaiones exiled from Serres. In Roman antiquity (168 BC – 315 AD) the city is mentioned in sources under the name Sirra (Greek: Σίρρα) and in inscriptions as Sirraion polis (Greek: Σιρραίων πόλις). It was an important city of the Roman province of Macedonia, with the status of a civitas stipendiaria. It flourished especially during the imperial period thanks to the Pax Romana. Then, during the great crisis of the Roman Empire (235–284 AD), the city declined and only in the times of Diocletian, with its reforms (Tetrarchic system), returned to prosperity. As regards the urban structure it featured, like all Greek cities (polis), a market ("agora"), parliament ("bouleuterio"), theater, gymnasium and temples. As we know from epigraphic evidence, the local government was also based on the known Greek institutions, which were the parliament (boule), the municipality ("demos") and the archons (politarchai, agoranomoi, gymnasiarchai, high priests etc.). It was also the seat of a federation of five cities ("Pentapolis") and actively participated in the provincial life and organization of the Macedonians; while many residents, mostly members of the local aristocracy, had received the right of Roman citizenship and were promoted to senior provincial dignities. Sirra as a city-state (polis), apart from the usual Greek institutions, held also its own territory (chora), which occupied the area of the former province of Serres. The organization of its territory was based on villages (komai, sing. kome), whose many sites have been found in various places near modern villages, such as Lefkonas, Oreini, Ano Vrontou, Neo Souli, Agio Pnevma, Chryso, Paralimnio etc. Within the limits of its territory have also discovered traces of marble quarries and iron mines, which indicate systematic exploitation of the existing mineral wealth in the imperial period (1st to 3rd century AD). In terms of population, except the most numerous Greek element, are recognized some population substrates even from prehistoric times. Concerning the society, the main feature was its distinction in upper (rich) and lower (poor) social strata (honestiores and humiliores in Latin). Finally, concerning the cults of the residents, except the known panhellenic cults (Dionysus, Zeus, Dioscuri, Apollo, Asclepius, Artemis and Isis), are evidenced and some local and Thracian cults as the Thracian horseman (or "Hero"). Many inscriptions of Roman (imperial) times have been found in the city (and to the early 1960s in the surrounding area). From these inscriptions (almost all written in Greek and only three in Latin), the eight are votive or honorific  and all other on epitaph reliefs or steles. The first attested bishop of the city is recorded as participating in the Second Council of Ephesus in 449. In the early Middle Ages, Serres became the site of a major fortress built by the Byzantine Empire to guard the empire's northern frontier and the strategic Rupel Pass. The city's history was uneventful until the 10th century, being in the heartland of the Byzantine Greek world, until it was pillaged and briefly occupied by the Bulgarians. In 1185, the environs of the city were pillaged by a Norman invasion, and in the Battle of Serres in 1195/6 the Byzantines were defeated by the rebellious Bulgarian ruler Ivan Asen I. After the Fourth Crusade, Boniface of Montferrat took over the city, but shortly after Kaloyan of Bulgaria defeated the Crusaders of the Latin Empire and briefly annexed the city, until it was retaken by the Crusaders in the early 1230s. According to George Akropolites, Kaloyan almost destroyed the city, reducing it from a sizeable urban centre to a small settlement clustered around the fortified citadel, while the lower town was protected by a weak stone wall. The city returned to Byzantine rule in 1246, when it was captured by the Nicaean Empire. By the 14th century, the city had regained its former size and prosperity, so that Nikephoros Gregoras called it a "large and marvelous" city. Taking advantage of the Byzantine civil war of 1341–47, the Serbs besieged and took the city on 25 September 1345. It became the capital of Stefan Dušan's Serbian Empire, but after Dušan's death in 1355 his realm fell into feudal anarchy, and Serres became a separate principality, initially under Dušan's Empress-dowager Helena and after 1365 by the Despot Jovan Uglješa. Jovan Uglješa maintained close political and cultural ties to the Byzantine court in Constantinople, and the Greek element rose again to prominence: local Greeks played a major role in his administration, which was carried out in the Greek language. After the 1371 Battle of Maritsa, the Byzantines under Manuel II Palaiologos (then governor of Thessalonica) retook Serres. Serres fell to the Ottoman Empire on 19 September 1383—although the Ottoman sources give several earlier and contradictory dates, the date is securely established by multiple Greek sources. The city (Siroz in Turkish) and the surrounding region became a fief of Evrenos Beg, who brought in Yörük settlers from Sarukhan. Althougn never rising to particular prominence within the Ottoman Empire, Serres became also the site of a mint from 1413/14 on. The rebel Sheikh Bedreddin was executed in the city. In the early 16th century, Serres was visited by the French traveller Pierre Belon, who reported that the town was mainly inhabited by Greeks alongside German and Sephardi communities, while the people in the surrounding country spoke Greek and Bulgarian. In the aftermath of the Christian victory at the Battle of Lepanto in 1571, Turkish reprisals were directed at the Greek population, who had shown sympathy with the Western success and had sporadically risen up across Greece. The metropolitan cathedral of Serres was looted along with seven other churches, while land and land titles owned by the Monastery of St John the Baptist were confiscated. In the 18th and early 19th centuries, Serres was an autonomous lordship (beylik) under a succession of derebeys, within the Sanjak of Salonica. At the end of the 18th century, Serres was a cotton-producing area, exporting 50,000 balls of cotton to Germany, France, Venice and Livorno. The metropolitan bishop Gabriel founded in 1735 the Greek School of Serres, which he directed until 1745. The school was maintained by donations from wealthy Greek merchants, among them Ioannes Constas from Vienna with 10,800 florins and the banker and tragic leader of the Greek War of Independence in Macedonia Emmanouel Pappas, who donated 1,000 Turkish silver coins. Minas Minoides taught philosophy and grammar in 1815–19. The school operated also in the period of the Greek War of Independence under Argyrios Paparizou from Siatista. Serres became a regular province c. 1846 as the Sanjak of Siroz of the Salonica Eyalet (later Salonica Vilayet). In the early 20th century, the city became a focus of anti-Ottoman unrest, which resulted in the Ilinden-Preobrazhenie Uprising of 1903. A Bulgarian army, which was commanded by general Georgi Todorov captured Serres during the First Balkan War on November 6, 1912, but was forced to withdraw by Greek forces commanded by the King of Greece, Constantine I, during the Second Balkan War. The first officer of the Hellenic Army to enter Serres was infantry colonel Napoleon Sotilis, head of the Seventh Greek Infantry Regiment on July 11, 1913. As the National Schism erupted in Greece during the First World War, Serres was temporarily occupied by the Central Powers after King Constantine ordered the local garrison not to resist to a token force of the Imperial German Army; eventually the city was liberated in 1917 by Greek-French Entente forces under the Venizelos government. 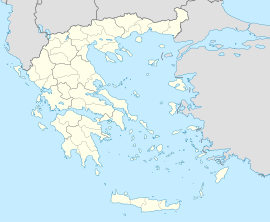 During the Second World War, after the conquest of mainland Greece by Nazi Germany in April 1941 (which was followed by the conquest of Crete in June), Serres was assigned by the Nazis to their Bulgarian allies (along with the rest of East Macedonia and Thrace and the island of Thasos), who occupied the city until the Allied liberation of Greece in 1944. In 1943, Serres' Jewish population was deported by the Gestapo to the Treblinka death camp and exterminated. There was a significant resistance movement in the city during the occupation, led by the left-wing National Liberation Front (EAM). In the postwar years, the city's population grew substantially, and there was also a significant rise in the standard of living. The long-serving conservative Greek Prime Minister Constantine Karamanlis (in office from 1955 to 1963 and again from 1974 to 1980) was a native of Serres, and as a result its people could count on the support of the central Greek government in Athens. However, the villages in the plains around the city were not so lucky; the low prices of agricultural products led many people of these villages to emigrate, mostly to the United States and West Germany. As of 2015[update], the Mayor of Serres is Petros Angelidis (independent, formerly a member of PASOK). The municipality has an area of 600.479 km2, the municipal unit 252.973 km2. Serres has a humid subtropical climate (Köppen Cfa) bordering on a semi-arid climate. Serres has an irregular precipitation pattern across the year, with no pronounced dry season, although rainfall is light year round. Summers are hot, whereas winters are cool but rarely very cold. Serres is the capital of a primarily agricultural district and is an important trade centre for tobacco, grain, and livestock. Following the development of a government-sponsored manufacturing area in the late 20th century, it has also become a centre for the production of textiles and other manufactured items. Various products, meat and dairy, are also produced by breeding at Lake Kerkini. Late Ottoman author Omer Seyfeddin set his fictional work White Tulip (Beyaz Lale) describing events during the First Balkan War in the town. 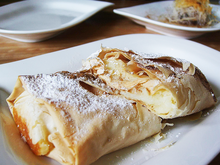 Probably the most well-known food from Serres is bougatsa. Additionally, gyros and souvlaki are standard forms of Greek cuisine served in many restaurants and taverns. One delicacy that is truly unique to the region is Akanés, which is a type of gourmet candy delight prepared according to a secret recipe since the beginning of the 20th century by the Roumbos family. Allegedly, Aristeidis Roumbos, the confectioner who invented this candy, disclosed the recipe to one of his loyal trainees, who then proceeded to establish a rival akanes business. Nevertheless, the Roumbos family, to this day, continues to produce this delight in their quaint workshop, which is reminiscent of life in the 1950s. Katakonozi is one of the most prosperous neighborhoods of the city, and it is currently experiencing a real estate growth. Kamenikia is one historic western neighbohood of the city. Seal of John, Metropolitan of Serres, 12th century. ^ a b c d e f g h i j Gregory, Timothy E.; Ševčenko, Nancy Patterson (1991). "Serres". In Kazhdan, Alexander (ed.). The Oxford Dictionary of Byzantium. Oxford and New York: Oxford University Press. pp. 1881–1882. ISBN 0-19-504652-8. ^ a b c d e Houtsma, Martijn Theodoor, ed. (1987). "Serres". E.J. Brill's First Encyclopaedia of Islam, 1913–1936, Volume VII: S–Ṭaiba. Leiden: BRILL. p. 234. ISBN 90-04-08265-4. ^ Vakalopoulos, Constantinos A. (1996). Ιστορία του Βορείου Ελληνισμού -Μακεδονία. Εκδοτικός Οίκος Αδελφών Κυριακίδη. p. 80. ISBN 960-343-017-X. The metropolis of Serres was looted along with seven other churches, the Monastery of St John the Baptist, while land owned by the monastery was confiscated. ^ a b Birken, Andreas (1976). Die Provinzen des Osmanischen Reiches. Beihefte zum Tübinger Atlas des Vorderen Orients (in German). 13. Reichert. p. 77. ISBN 978-3-920153-56-8. ^ Vakalopoulos, Constantinos A. (1996). Ιστορία του Βορείου Ελληνισμού -Μακεδονία. Εκδοτικός Οίκος Αδελφών Κυριακίδη. p. 130. ISBN 960-343-017-X. At the end of the 18th C, Serres was cotton producing area, exporting 50,000 balls of cotton to Germany, France, Venice and Livorno. ^ Vakalopoulos, Constantinos A. (1996). Ιστορία του Βορείου Ελληνισμού -Μακεδονία. Εκδοτικός Οίκος Αδελφών Κυριακίδη. pp. 131–132. ISBN 960-343-017-X. ^ "Serres Climatological data 1971–1997". Hellenic National Meteorological Service. Retrieved 1 May 2015. ^ Boyar, Ebru (29 June 2007). "Ottomans, Turks and the Balkans: Empire Lost, Relations Altered". I.B.Tauris – via Google Books. ^ Koroglu, Erol (21 July 2007). "Ottoman Propaganda and Turkish Identity: Literature in Turkey During World War I". I.B.Tauris – via Google Books. Wikimedia Commons has media related to Serres, Greece. The deportation of the Jews of Serres to the Treblinka extermination camp during World War II, at Yad Vashem website.